The EFCC Lagos Zonal office, have arrested four suspected Internet fraudsters. They are: Oluwaseun Michael, 28; Igbokwe Chijioke, 27; Felix Chukwudi, 22 and Babajide Goloba. The quartet were arrested in different parts of Lagos, following intelligence report received by the Commission. They are alleged to have defrauded their victims, mostly American and European citizens, millions of Dollars. 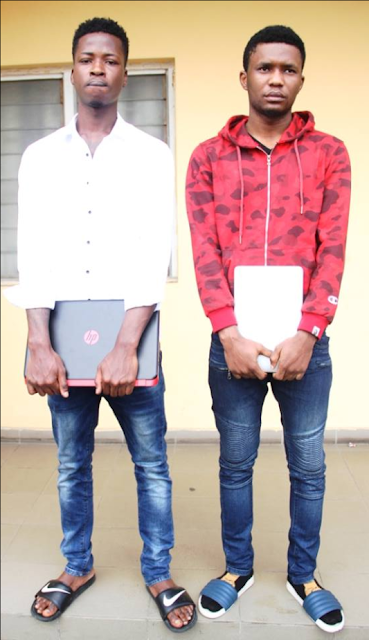 The suspects, school drop-outs, have confessed to have been involved in romance/ marriage scam, Internet advertisement scam, spoofing of emails and interception of business mails.